This is by far my favorite foundation I have ever tried. I got given a sample at the YSL counter before the UK launch of this foundation and was so impressed. I bought it pretty much as soon as it came out back in July and I've only just run out last month, I think that's pretty good for a foundation which you use everyday. I love the smell of this product, it's fresh and almost smells like my favorite perfume (Chanel Chance Au Fraiche) so I love it. It feels like you haven't got anything on your skin because its so light but it still manages to give you a medium coverage. This definitely isn't a full coverage foundation so if your looking for full coverage this isn't the one for you. 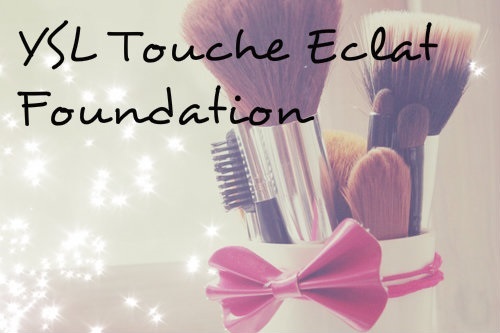 It contains the touche eclat formula which I love because it gives you a really glowy complexion without being shiny and picks up on the light which looks really pretty. When you first apply it, its quite shiny but if you leave it for a couple of minutes it dries and goes more matte so I don't think there is much need to wear a lot of powder with this foundation if you don't want to. It's a little expensive as it costs about £28 for a bottle but i definitely think that its worth it and will be buying this again when I get the chance! Let me know if you have tried this foundation and what you think of it, Hope you're all having a lovely weekend! Foundation on hand - looks like nothing at all but is covering a lot of imperfections which I have on my hands! The foundation really does work like highlighter in the light! I would love to try some Illamasqua products, I've heard their cream blush is really good but none of the shops stock it where I live and I hate buying make up online if I cant see the colours in person first!